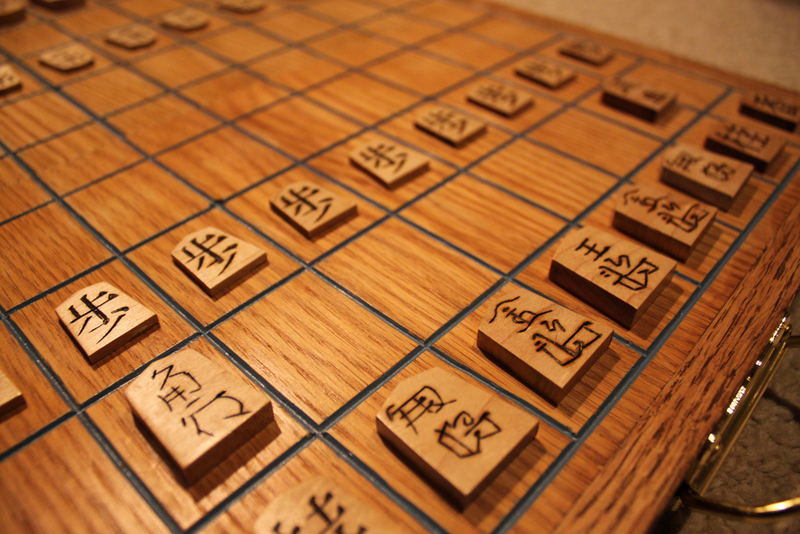 For Christmas I decided to make a Shogi game for my son. 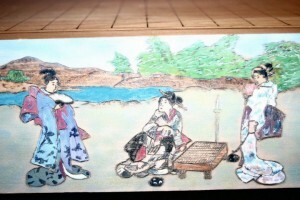 He was stationed in Japan during his stint with the USMC and his soon-to-be-wife’s father turned him on to this game. Ironically, at the same time, I was researching a game to make and thought that this would be a challenge. 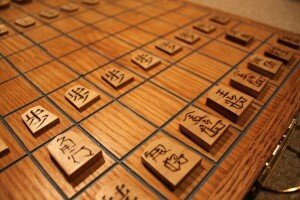 This game is similar to chess but more difficult. There are two sides to most of the pieces with one being red and the other black. I wanted to make a case that could travel well so I found some oak and cherry in my shop and started building. 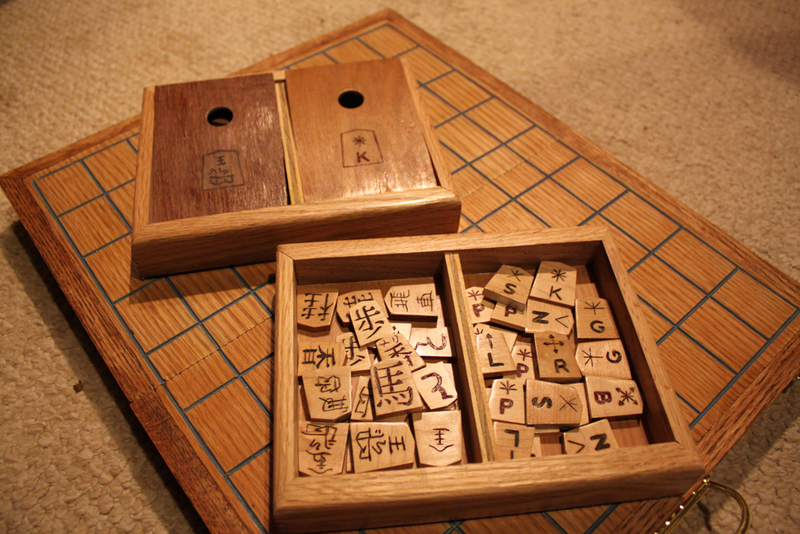 The pieces were made from some maple that I had. I’ve had this maple for about 20 years stored in my basement. My brother-in-law gave me about 350 child’s crib headboards that he could not sell. I spent time removing things that I thought would be useful. 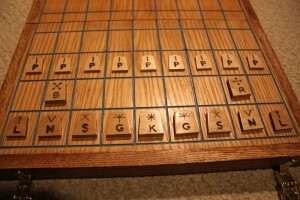 There were many slats that were about 3/8″ thick and a an inch or so wide. I had to plane the pieces down to 1/4″ and 1/8″ thick. Since my planer could not reduce the stock to that thickness, I built a jig to do it safely. 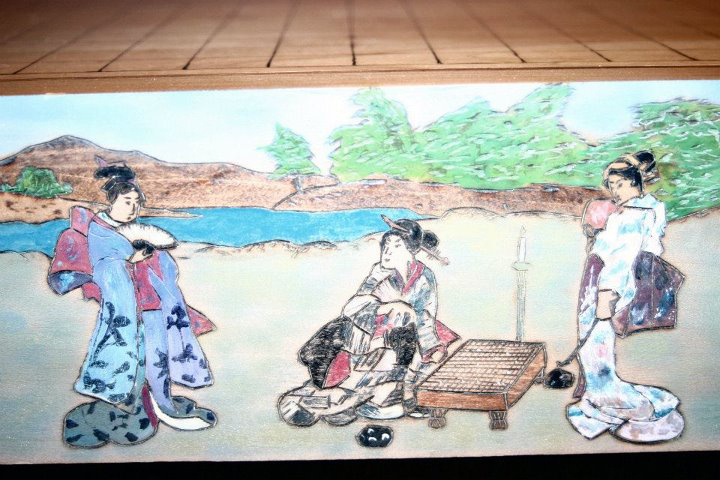 The Shogi game has pieces that are varied width, lengths and thicknesses depending on the rank of the piece. 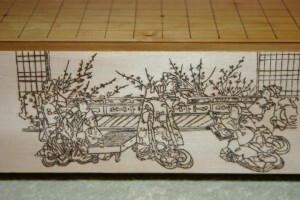 The difficult part was to draw Japanese characters (Kanji) onto the pieces and then woodburn and carve. I used a Foredom to make the letters thicker. I also made a universal set that showed the directions of the pieces and their ranks. 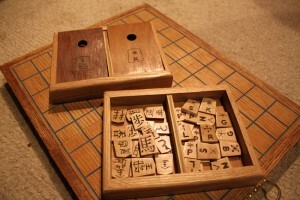 This way my son would play the game until he learned the Japanese characters (he is presently studying Japanese in college). 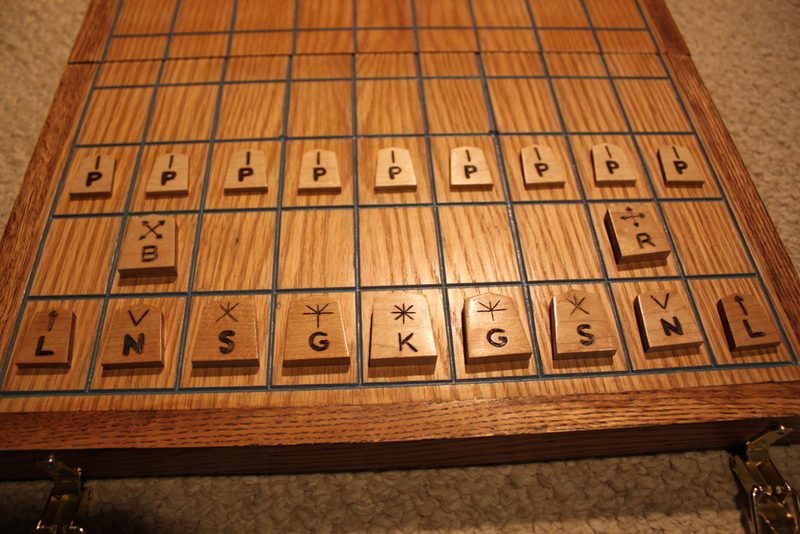 Of course, most of these pieces had to be carved on both sides. I then painted the red ones and once I completed all of them, I used some HUT wax and buffed each piece. I just used an old refrigerator motor with a mandrel (left-handed threads) and attached some pads. 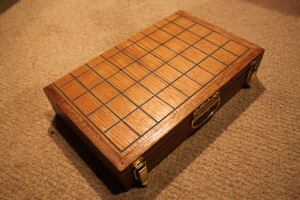 At the same time I was making this, I also made a Rummikub game for my son’s wife. That game had 8 sets of 1-13 with jokers. Each one carved, painted and buffed. Both of the games took about 3 months to make. It was real tedious work but I was proud of the outcome and both recipients of the gifts fell in love with the games. I’ve made many things in my life and this one is right up there with one of my favorite and most difficult to make (the others being a totem pole, dollhouse and Southwestern chair). 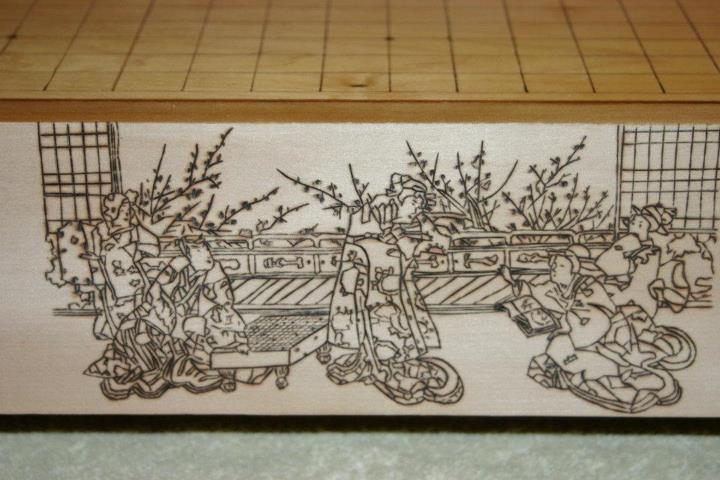 I’m currently working on this GO game – woodburned and airbrushed.